Diageo plc (DEO) produces, distills, brews, bottles, packages, and distributes spirits, beer, wine, and ready to drink beverages. This international dividend company has increased dividends for 15 years in a row. Diageo owns a portfolio of strong brands, with wide consumer appeal. The company’s latest dividend increase was announced in January 2014 when the Board of Directors approved an 8.80% increase in the interim dividend to 19.70 pence /share. The company’s peer group includes Brown-Forman (BF.B), Beam (BEAM), and Constellation Brands (STZ). Over the past decade this dividend growth stock has delivered an annualized total return of 12.40% to its US ADR shareholders. The company has managed to deliver an 8.90% average increase in annual EPS in British Pounds since 2004. Diageo is expected to earn $6.82 per share in 2014 and $7.27 per share in 2015. 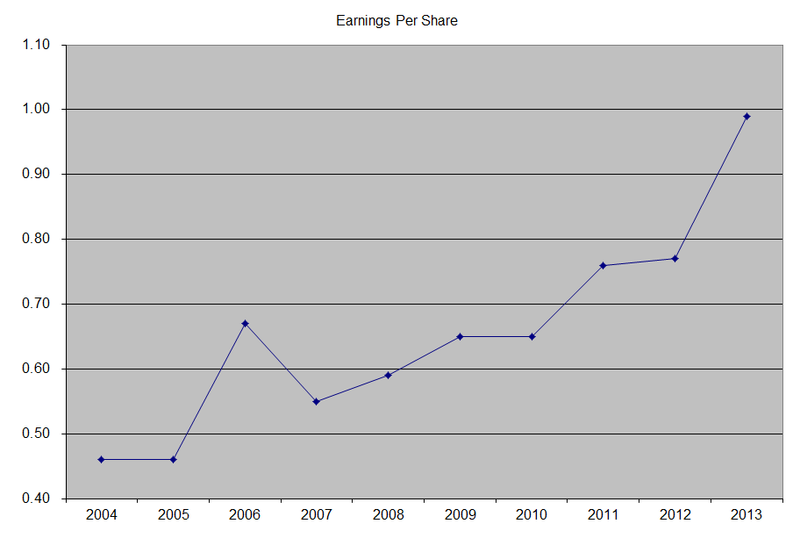 In comparison, the company earned the equivalent of $6.19/share in 2013. Each American Depository Receipt (ADR) that you can purchase on the NYSE is equivalent to four shares that are traded on the London Stock Exchange. Between 2004 and 2013, the number of shares decreased from 3.03 billion to 2.52 billion. 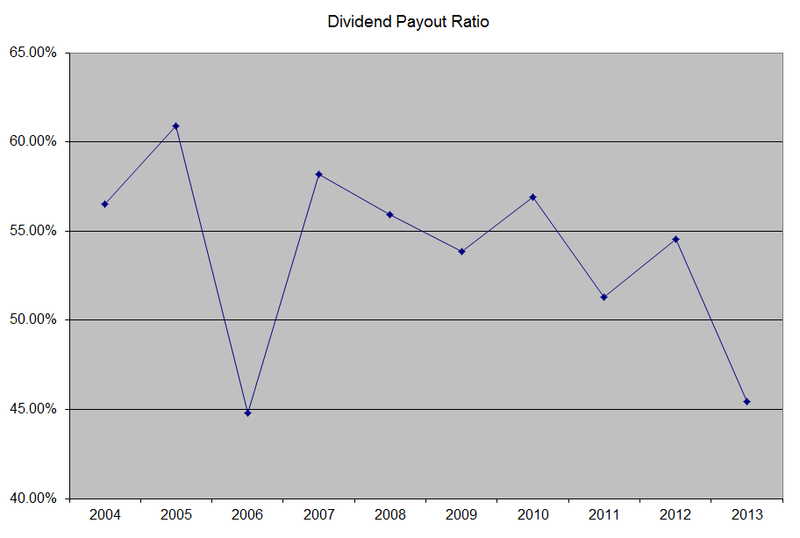 The annual dividend payment has increased by 5.80% per year over the past decade, which is lower than the growth in EPS. 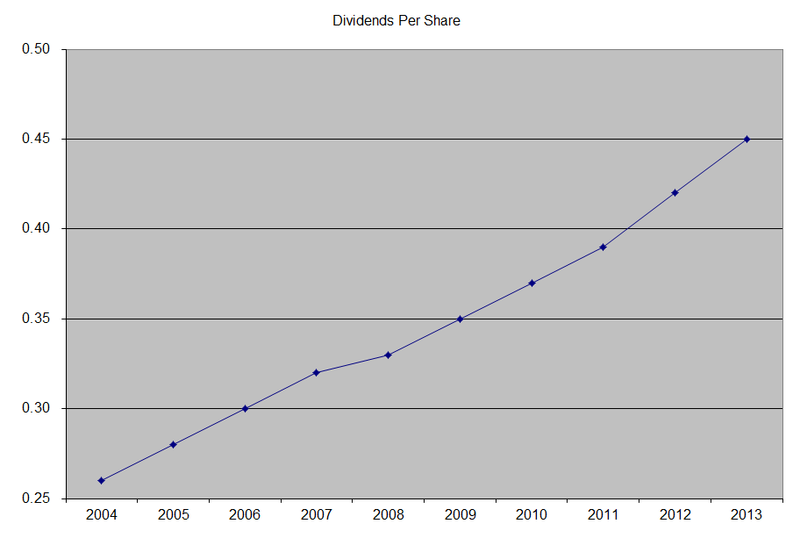 A 6% growth in distributions translates into the dividend payment doubling every twelve years on average. The expected dividends in 2014 are roughly double the dividends paid in 2003. 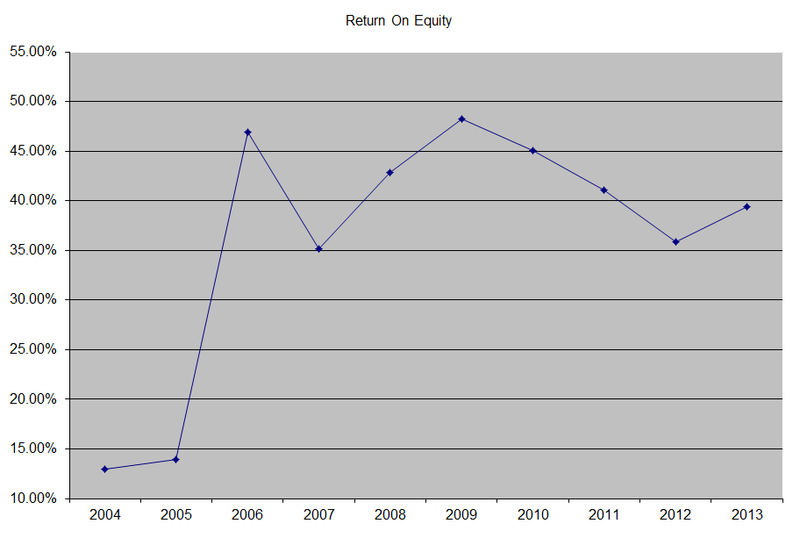 The dividend payout ratio has decreased from 56.50% in 2004 to 45.50% in 2013. A lower payout is always a plus, since it leaves room for consistent dividend growth minimizing the impact of short-term fluctuations in earnings. Currently, the stock is attractively valued, as it trades at a P/E of 18.20 and yields 2.60%. I am analyzing the company because I believe it is quality dividend growth stock, which is very good addition to my portfolio when it is below a P/E of 20 and at a current yield above 2.50%. I currently find Diageo to be a much better value than Brown-Forman (BF.B), at 29.60 times earnings and yield of 1.60%. I recently purchased Diageo shares for my taxable and tax-deferred accounts.